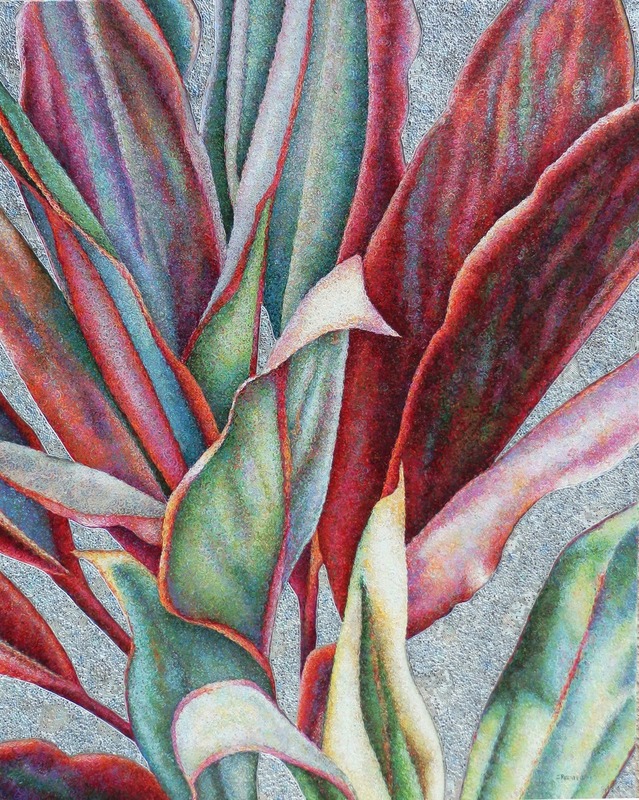 Pennsylvania artist, Elynne Rosenfeld, creates majestic mixed media paintings, with a very unique combination of materials. From her own artistic journey and personal experience, Elynne came to jewelry making and took her love of beads into her paintings. 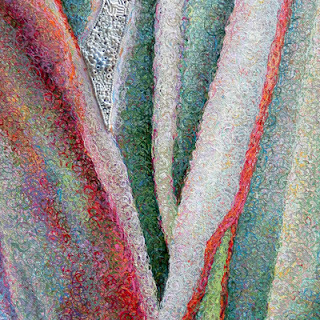 With her natural affinity for detail, Elynne's works invite the viewer into the painting field to experience the piece from different vantage points, up close, and also far away. Each piece is intricately woven with layers of color and glass, designed precisely to create a subject that flows effortlessly on the canvas. Elynne began her art studies at Rice, when the fine art program was just beginning. She had encouraging professors backing her style and talent, and she realized at that young age that she could pursue art as a life calling. At the time, she found her niche in acrylics being that they were the primary medium used in undergrad. Even after some experimentation in oils during and after grad school, she found her way back to acrylics because of their diversity and ever changing technology. "The medium has come a very long way, with all kinds of gels that produce effects once only possible with oils, and even effects beyond what oil allowed. I like to build up a surface in my painting, and find it interesting to experiment with the technology as it evolves," she explains. 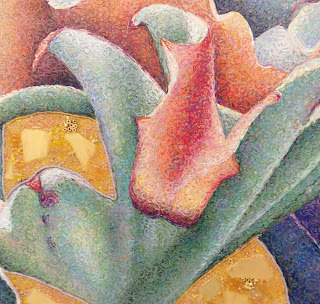 "Also, the gels facilitate adhestion to canvas," which Elynne uses faithfully adding her glass and bead work. She also uses interference paint, which changes colors when viewing the work from a different angle. "The advantage of this is that the resulting pieces are quite interactive in person." 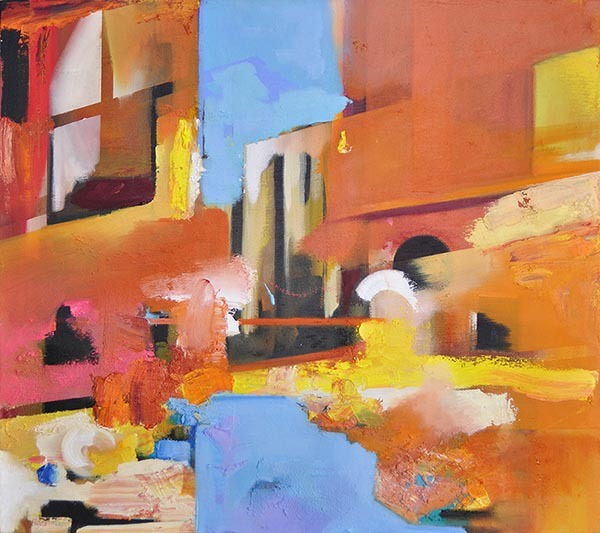 Elynne's underpaintings call for larger flats, rounds and filbert brush shapes, which shows as the larger subject seen from a distance. However, when up close and personal with the work, it is evident that the paintings have incredible detail, layers of tiny spirals. For this work, Elynne is using small script brushes, sometimes as small as a 10/0. 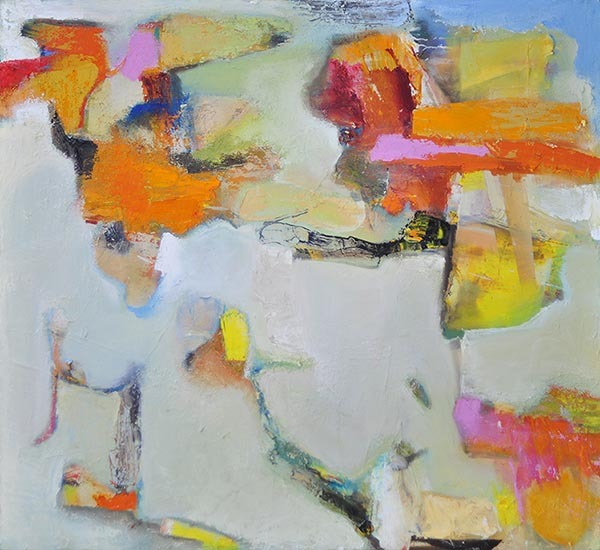 Although Elynne's primary focus is now on abstraction, she has moved throughout the range of subject matter in her career, taking the time to work figuratively and at various levels of abstraction. "I believe in the essence of things as opposed to the thing itself. By that I mean that the inherent message in a well done artwork transcends its subject matter. At times, I am able to express better through abandoning the obvious image," she says. The advantage to viewing Elynne's work in person is to catch the pieces' movement and interaction, the detail, and the reflective color. 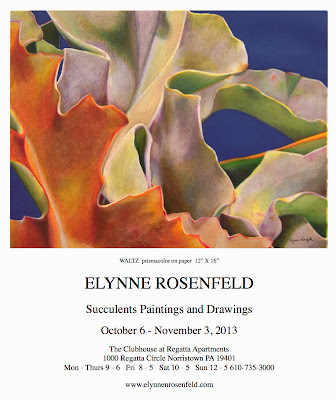 It means to see her talent for the subject matter captured exquisitely in brilliant acrylic and glass. Right now her work is on exhibit at the Clubhouse at Regatta in Norristown, PA up through November 3rd. On November 15, for one night only her work will be featured in a fundraising event, "Looking Out For Kids", at Salus University, Elkins Park, PA to benefit children with eyecare needs. Ink has been around as a tool for artists and writers since before 2000 BC, a material that scientists have been able to evaluate because of its permanence and one of the reasons artists are drawn to it today. Carbon and Iron Gall ink are two of the earliest known inks with recipes deriving from natural plant and animal life. Carbon ink is created from burnt wood or bones, mixed with animal glue. Carbon doesn't fade over time and isn't harmful to the paper, however it might smudge in humid environments, even if it is on an old document. Iron Gall ink is created from iron salts and the oak galls found on many species of oak trees. It goes on blue-black and dries to a brown. Because of its acidity, iron gall ink can damage paper long term. Conservators have different methods of handling the problems each type of ancient ink brings to the field. Today, fine art ink can be made from many different ingredients, the goal of which is to create a liquid or paste substance with brilliant color, rapid drying, water resistance and permanence. Inks are either pigment or dye based for their color. Pigments are solid, opaque or transparent particles suspended or dispersed in a liquid; whereas, dyes dissolve in the liquid vehicle. Inks are also manufactured in various liquid vehicles, like acrylic resins, shellac or alcohol. Each manufacturing company also adds ingredients such as waxes and driers to augment the ink's properties even further. Acrylic inks have wonderful permanence and lightfastness and they mix well with water. Shellac based inks can be either pigment or dye based and may or may not be mixable with water, but they have brilliant color and some water resistance. 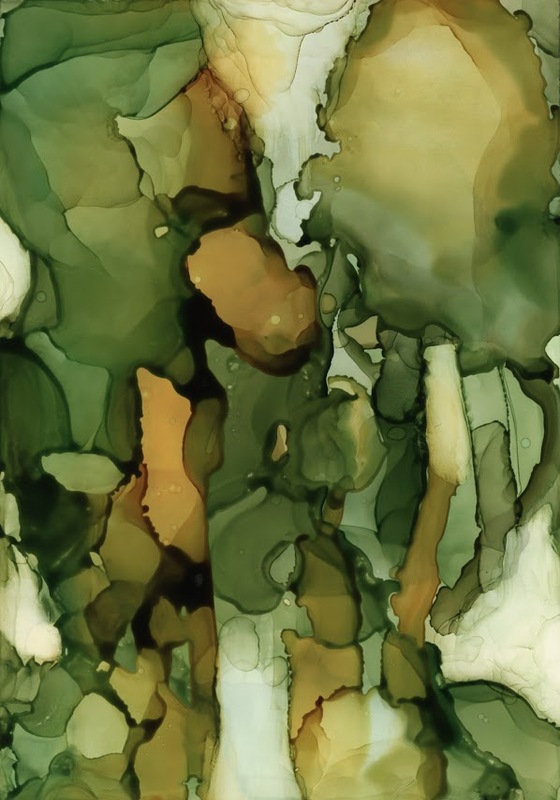 Alcohol inks are dye based inks, and are often used in markers for their fluidity. Dynasty offers artists a line of brushes created specifically for ink artists, the IPC line, with several shapes and tufts that are unusual, unique for the medium. The IPC line can be used for application, blending or texturing. However, if you're using inks to color your drawings or scratchboard art or as part of mixed media work, you will likely prefer a soft brush line, like the Faux Kolinsky or the speciality brushes in Black Gold. 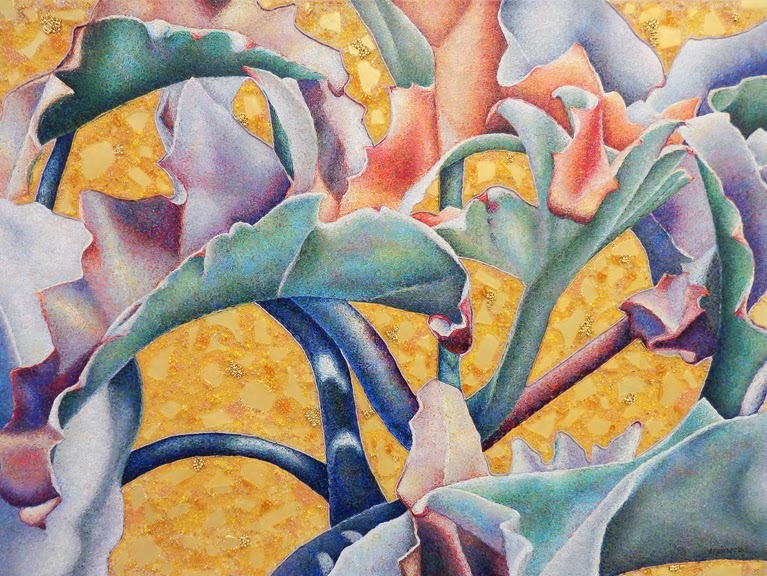 Featured Artist Andrea Pramuk uses inks quite frequently in her work. Much of her work is a mix of alcohol inks and cold wax. She has been using the larger Black Gold rounds for years because of their ability to hold a lot of fluid for her soft abstract pieces. If you're interested in working with ink, choose the type of ink you'd like to try before choosing a brush. Whether the ink is pigment or dye based, shellac or acrylic based will alter the brush you choose. How you decide to apply the ink will also help you find the correct brush. If you already work in inks and would like to share your art with us, please do so! We always love hearing from our artists. Manhattan Arts International is one of several art organizations that Dynasty Brush, Inc. supports and sponsors. 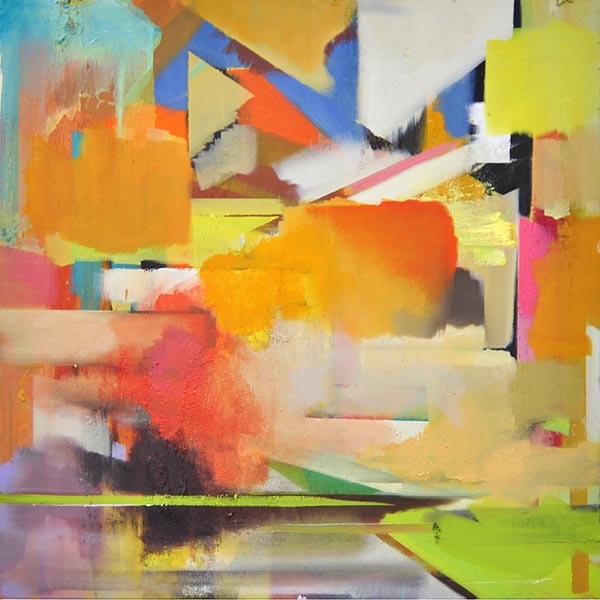 In their latest online art competition, Manhattan Arts called for works that are uplifting. "The Art that Lifts our Spirits" online gallery is now on view with the winners exhibited at the top of the webpage. As a sponsor of the competition, Dynasty had the honor of choosing a winner from the selection of finalists for a brush prize package, and we chose Anne Schwartz's work, Vesuvius Erupted 216. Manhattan Arts International is an organization created to provide resources for artists, exhibition opportunities and information about the international art community. Each year they present juried exhibitions in order to provide all artists with career opportunities and advancement. As a result, thousands of artists from around the world have received exposure, publicity, and awards for their art work. You can read more about their organization through their website or blog. When the exhibition opened for Dynasty to choose a winner, Anne's work stood out amongst the rest. It was clearly an uplifting work, designed with thought and skill and a powerful use of color. 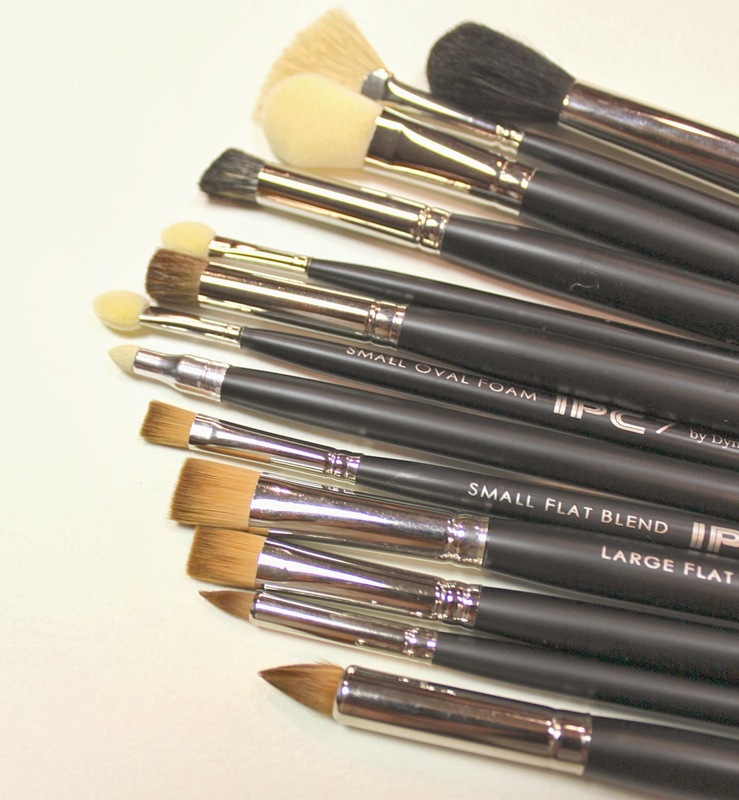 Not only was I thrilled to send Anne her $200 prize package of brushes, including Interboros, Interlock Bronze and Faux Squirrel, but I wanted to interview her to ask about her work and process. Anne found out about the competition through Renee Philips and her eNewsletter on Manhattan Arts International. Anne doesn't normally enter competitions but felt that her work clearly exuded the principle points that the contest required. Anne started her formal work as an artist doing jewelry design, with a successful international business. After taking some time out of work for family, she felt that painting would be a better calling when she returned. With her background in design, her current works show an exceptional understanding of both design and color as well as texture. The above work, Vesuvius Erupted 216, is part of a larger series entitled "Ricordi D'Italia" because of Anne's love for Italy. Throughout the series, Anne works from photographs she has taken, doing realistic underpaintings in acrylics. When she is pleased with the "drawing", she abstracts the work in oils on top, leaving bits and pieces showing of the original work underneath. 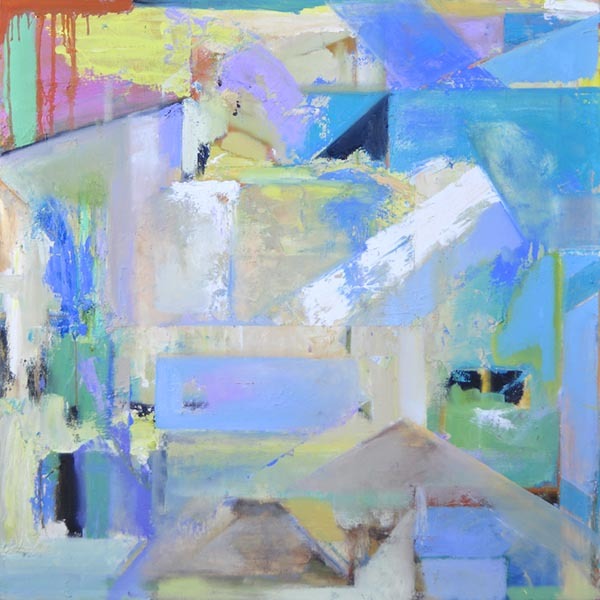 She finds the challenge to be in the abstraction rather than capturing the landscape in a representational painting. Most of Anne's brushwork then is in the underpainting, though often she'll use whatever tool is necessary for the oil painting portion on top. She primarily uses a lot of angle brushes, large flats, in natural bristle. However, Anne was thrilled to find a Dynasty Wave Brush in the package she received for her award because she is looking forward to trying a new shape.